I made a special trip to the Chase bank branch today and noticed that they were promoting a new Disney debit card. 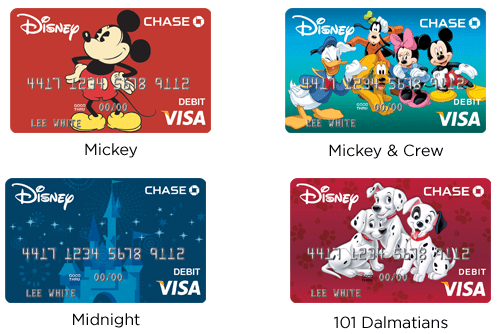 Turns out, Chase and Disney have teamed up to introduce this new Disney Visa debit card, a special version of the Chase checking debit card that provides perks at Walt Disney World, Disneyland, Disney stores, and Disney Cruises. This card was introduced in July 2012 and carries no annual fee. No credit check is required to convert your Chase debit card into this Disney debit card. - 10% off select merchandise purchases of $50 or more at Disney Store locations, Disneystore.com, Walt Disney World, and Disneyland resorts. - Character Meet ‘N’ Greet at a private cardmember location at Walt Disney World and Disneyland resorts. Here, cardmembers can meet some of their favorite Disney Characters and receive a complimentary 5 x 7 photo. This is probably the most useful benefit of having this card. I’m excited to get our photo when we go to Disneyland next month! You can read more about the different perks here. The Disney Visa Debit card has the same security and safety benefits as the normal Chase Visa Debit ATM card, which includes fraud monitoring and liability protection. If you follow this blog, you know that Chase is my favorite big bank. Likely you already have a Chase checking account or one of the many ultimate rewards earning Chase credit cards. There’s no reason NOT to convert your debit card into a Disney Visa debit card. Overall, I still advocate using credit cards to make purchases whenever possible. Debit card purchases simply do not offer as much protection on your purchases like credit card purchases do. As a reminder, using your debit card as a "credit" charge does not mean it has the same protection as using a real credit card. Honestly, I decided to sign up just because I think it’ll look cool to have Mickey on my ATM card. It definitely adds more benefit than the basic Chase ATM card, albeit not much. To convert your debit card into a Disney debit card, call Chase at 877-388-5726 or stop by your local Chase branch (the process took less than 5 minutes for me at the bank today).